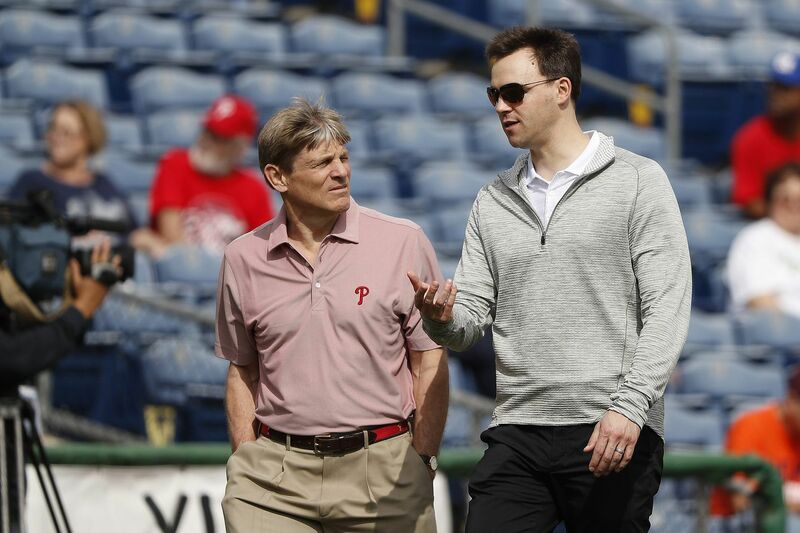 Phillies owner John Middleton, left, talking with GM Matt Klentak during spring training in 2017. We've heard from Gabe Kapler. He admitted in this final week that, despite his public veneer, he can become quite frustrated and angry, especially when his team is in the midst of a hellish freefall and he has no idea how to stop it. As the losses mounted, you started to feel sorry for his chewing gum because it was taking a beating worse than the ones the Phillies absorbed during their four-day stay in Colorado. The Phillies manager also confessed that he is seeking feedback in the form of anonymous surveys in order to figure out how he and the team can be better. "I'm collecting as much information as I can because I know that adjustments need to be made in 2019," Kapler said. We've heard from Matt Klentak. The general manager described the Phillies' collapse as "awful" and admitted that "significant changes" will be necessary before next season, but he believes strongly in Kapler as the right fit to be the team's manager. Klentak also said that the season was "productive" and that the team's young players will learn from the experience. He did not buy the notion that nothing good came out of the season and does not think you can ignore what happened through the first four months. Maybe not, but his manager likes to talk about sample sizes and the ultimate sample size is a 162-game season. If tradition holds, we will soon hear from team president Andy MacPhail. The last time we heard from him, the Phillies were trying to figure out a way to get better at the trade deadline and MacPhail said that development took him by surprise. His postmortem news conference figures to take on a different tone. The opinions of the manager, general manager, and team president mean a lot, but it is the managing partner we really need to hear from as this once promising season comes to a crashing halt. It is time for John Middleton to offer his opinion about what happened to his team and to explain how he thinks things can be fixed. When Klentak fired Pete Mackanin as manager near the end of last season, MacPhail made it clear that it was his general manager's decision. "The GM only gets so many managers," MacPhail said before Klentak hired Kapler. Phillies manager Gabe Kapler was hired by Matt Klentak. The truth is that the entire operation is a reflection on Middleton. The fiercely competitive billionaire famously told Ryan Howard after the Phillies' 2009 World Series loss to the New York Yankees that he wanted his trophy back. At the time, he was one of the "silent" partners, but that all changed a few years ago, when David Montgomery stepped aside as president. This is no time for Middleton to fall silent again. MacPhail hired Klentak and Klentak hired Kapler, but, make no mistake, the Phillies are Middleton's team and what is taking place is his vision. He was the one who wanted an enhanced analytics department and now, just three years after Sports Illustrated named the Phillies as the least analytical team in professional sports, he has one of the bigger operations in baseball and it is still growing. There's nothing wrong with that. The Houston Astros are considered by many to be the top analytical team in baseball and they are holding onto Middleton's coveted trophy right now with a chance to defend it this October. This was clearly a huge transition year for the Phillies in terms of watching how analytics are implemented on the field and it would be an understatement to say it was a rocky road. Lots of infield shifts led to mostly lousy defense and complaints from veteran pitchers Jake Arrieta and Pat Neshek. The Phillies hitters, for a second straight season, set a team record for strikeouts and they are going to score fewer runs than they did last season. The bullpen ERA, for all of Kapler's innovations, is identical to what it was last season. Lots of Klentak's moves can be questioned, starting with the signings of Arrieta and first baseman Carlos Santana and his failure to get starting pitching help at the trade deadline. Middleton is a lifelong Philly guy and he has presided over the team as his president, general manager, and manager have made former Phillies become an endangered species around the ballpark with the exception of the broadcast booth. And if you listen to those broadcasts, you can hear the skepticism about what has transpired this year and whether it will get better. Maybe Middleton's answer is to throw tons of money at either Bryce Harper or Manny Machado. We know all about the Phillies' resources, but it's entirely possible that neither one of those players ends up in Philadelphia. What Phillies fans need most right now is to hear from the team's managing partner. This is his team and his vision, and it would be nice to know what he thinks about the ugly recent past and how it might impact the future.